2. Base price of Manugraph India Ltd is 37.85, So if this stock available 15 % below his base price( near 32 ) then it is a best value pick. 4. Net selling per share per year is 84.01 So we can easily get a target of 60 to 90. 5. Manugraph India Ltd is a dividend paying company and pay 1 to 2.50 rupee dividend per year. 6. No any bulk deal , bonus issue in last 2 year. 7. 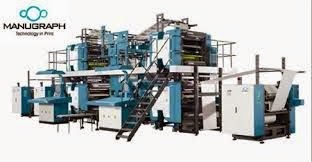 Manugraph India Ltd was established in 1972 and Manugraph is India's largest manufacturer of web offset presses. 9. Discloser:- I have no any share of Manugraph India Ltd but buy 100 share if available @29 to 31 in near term. Sorry to say, very bad stock, there is no average growth in sales, profit for five years, current quarter result is worse than last year quarter, current ttm result is dragging low, may be this should be skip and suggested better one..
First of all thanks for allow my comments after somany days.... i was tracking for the answer in the query for sometime where as it was not posted. I am enable comment moderation on all of my blogs for prevent spam links or illegal comments. So usually it any comment will take 1-3 days for publishing in my blog. I never take part in debates because stock market all always volatile and I honestly agree that some of my Recommendation like SRS Ltd, Dhunceri Petrochem etc still wait to perform. No doubt your research are good.. but i think you still not read my full theory in my book where I clearly say that my minimum holding period is one year for any of stock. I never check regular price of my fundamental buying. At last I choose a stock my own criteria s which i mention in my blogs and book and i an not compare past sales and profit data in my theory. However we have no any concerns ..each people have his own view and own theory so it is natural. At last I feel sorry if my earlier comment heart you but I never means that your points are wrong. So no any debate, no any concerns. My registration number is 13145. I have one query, what you think if stock is fully pass all your fundamental conditions. But its volume of trading is less. Then we should buy it or not. E.g. : Asian Hotel (West). It fullfill all Fundamental Condition but trading volume is less. Please tell your views when trading volume is less. For Dhunseri Petrochem also year high and low is coming more than two. We cannot consider low volume as a bed thing because when a good stock are away from market rumours and market players then it volumes are always low.